King Abdel Aziz , P.O. 365143 Riyadh RiyadhGuests can enjoy a cup of hot coffee and a pastry at the café, while buffet and á la carte specialties are served at the restaurant. Room service is also available. Make yourself at home in one of the 78 individually furnished guestrooms, featuring refrigerators and minibars. Complimentary wireless Internet access keeps you connected, and cable programming is available for your entertainment. Private bathrooms with shower/tub combinations feature complimentary toiletries and hair dryers. Conveniences include phones, as well as safes and desks. Make yourself at home in one of the 286 air-conditioned rooms featuring refrigerators and LCD televisions. Your bed comes with down comforters and premium bedding. Satellite programming provides entertainment, and wired and wireless Internet access is available for a surcharge. Private bathrooms with shower/tub combinations feature deep soaking bathtubs and complimentary toiletries. Feel welcome the moment you arrive at DoubleTree by Hilton Hotel Riyadh Al Muroj with a signature chocolate chip cookie at check-in. 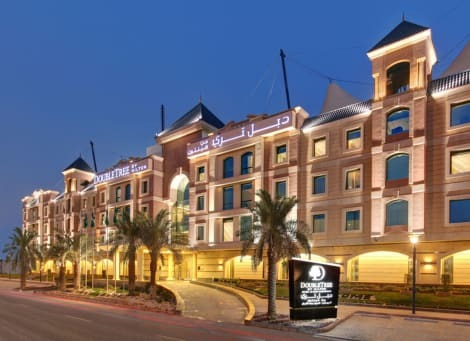 Boasting a fantastic location right next to the expanding King Abdullah Financial District, the hotel also offers easy access to several other business districts, educational institutions, shopping malls and Riyadh attractions. 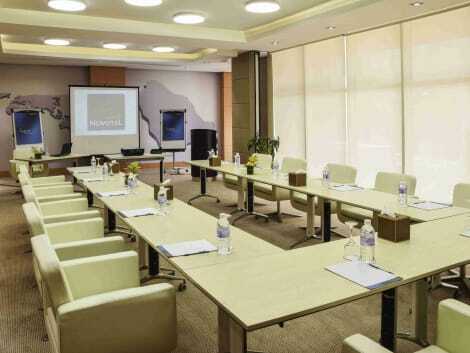 King Khalid International Airport is only 15 minutes away and the city center and Diplomatic Quarter are just 20 minutes from this stylish hotel in Riyadh.With six conference rooms and a board room, this Riyadh hotel provides an ideal venue for impressive business and social functions, training events and weddings. Our naturally-lit lobby lounge atrium is the perfect setting for breakouts, and our professional events staff, creative catering services and modern A/V equipment will ensure your event is a success. Unwind in a spacious and inviting guest room, equipped with air-conditioning; complimentary WiFi, an interactive HDTV and a comfortable Sweet Dreams® by DoubleTree Sleep Experience bed. Luxurious suites are also available at this Riyadh hotel, offering splendid city and park views, a separate living/dining area and a contemporary entertainment system with a 46-inch HDTV.Refresh with a dip in the sparkling indoor swimming pool, energize with complimentary 24-hour fitness facilities or be pampered with a luxurious massage or spa treatment (separate leisure/recreation facilities available for males and females). Enjoy a selection of international cuisines in the relaxed, all-day dining restaurant and recharge with a coffee and a light, tasty snack in our welcoming coffee lounge.